My former Korean student called me the other day and said that she wants to visit us. She said that she's coming tomorrow so when I woke up this morning, I started cleaning up the house. We bought a new vacuum in replacement to our dirt devil one that don't work good anymore. We bought bissell this time, hopefully this will last a little longer than our old one. Here's my son looking at his new toy. He loves helping me run the vacuum. Hubby suppose to steam the carpet but he changed his mind and cleaned the car instead lol.. Now, my back hurts from all that scrubbing I did in the bathroom, kitchen floor and vacuuming the carpet.. So, I am signing off now dearest friends! I will visit you all back tomorrow. I should follow your steps and buy a new vaccum. Mine actually brings more dirt, lol. It's always great to see a new baby pictures. So cute. Bissell is what we got too, and so far, it works really good. That's why sometimes, it's better if I don't have guest over the weekend, kasi, ang hirap maglinis, wwahhh! dyahi naman kung makalat. I love the way you did your curtain, kapag nakabili ako ng ganyang kurtina, turuan mo ako huh?? sa Pinas, halos puro ganyan ang style ng mga kurtina eh. Visit this post pala, i mentioned your name in the original kasi ,hehehe...wala link naman para d obvious. Nice looking vacuum, hope you are resting from all that work. I swear your son is growing like a weed. Have fun when your Korean friend comes. 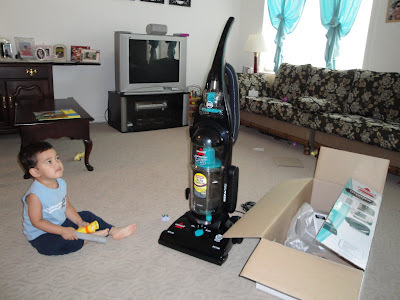 you just bought a new vacuum just recently sis ah...hehehhe...panay ata yung gamay mo sa vacuum...joke! nako yung dirtdevil madali masira....:) seems like EJ is ready to clean up! You are an ideal wife Rose. You are so hardworking doing the household chores, taking care of your children and hubby and you still have the time to bond with your family and to blog. Wow, you must be Wonder Woman. Thanks for the post. God bless you always. Minsan nakakapagod yong pag ba vacuumed kasi ang bigat hehe. But yong resulta naman is very clean ok lang din. Good thing your EJ loves helping household chores instead of helping trashing the place hehehehe. Pareho tayo ng vacuum bakla red lang sa amin. I think they work okay, okay sya finish your work there chop! chop!